The U2 360 show in Denver took my breath away in so many ways. For starters, mile-high Denver is 5,280 feet above sea level. Tallahassee is 200 feet, on the high end. Between doing laps around the stadium looking for the best vantage point to peek in on U2’s sound check, charging the field at full throttle after speed-walking past security to get the best placement on the rail, and climbing up and down and up again on the many stairs at Red Rocks, I was gasping for air. I’m not in the best shape of my life, but I will safely blame it on the altitude this time. But, the lack of oxygen only added to the euphoria of the trip. I’ve been looking forward to seeing another 360 show since going to the Charlottesville and Raleigh concerts in October 2009. I bought a ticket for the July 12, 2010, Philadelphia show in November and, like all U2 fans, was disappointed the summer 2010 dates got postponed after Bono’s back accident, but grateful they would happen at all after such a potentially devastating injury. Once they added even more shows to the rescheduled U.S. leg, I decided I wanted to see an opening night concert. So, in January, I made plans to go to Denver. Before I knew it, it was here. As big a band as U2 is, the front of the general admission (GA) line is a small world. You meet people at one show who become your best friends and the next time you see them is another GA line. I met several people at the Charlottesville 360 show that I’ve been looking forward to seeing for 18 months. Tim C. is my U2 guru and part of my motivation for doing so many shows this leg. He knows more about U2 than I will ever think to ask, and he’s a pro at the pre-show ritual. We made plans to go to the show together, and I was nothing less than giddy to see him in the Denver airport in his Vertigo sweatshirt and Lemon T-shirt. Jennifer J. is another incredible Charlottesville alum I’d been counting down to seeing, and it was like no time had passed when we eventually met up later that day. Tim and I left the airport and made a beeline for the GA line. We were Nos. 79 and 80 — higher than I’ve ever been before, but considering this was a tour leg opener, I was thrilled with a relatively low number. The line had actually been started on Wednesday, so to check in at 1:30 p.m. Friday and still be in the first 100, I was doing OK. And, the awesome news was we wouldn’t have to camp out all night. We just had to be back by 4 a.m. to secure our spots. 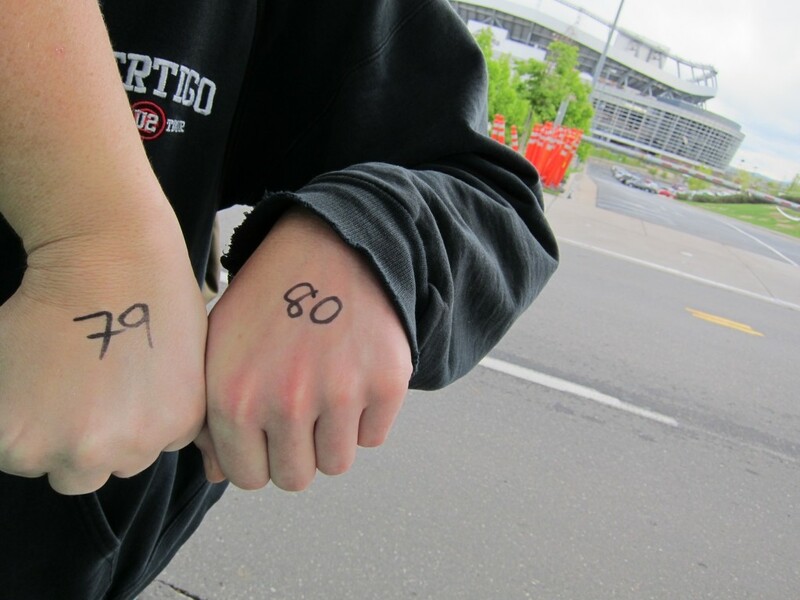 We were standing in the GA line across the street from Invesco Field talking with other fans and listening to what I assumed were the techs sound-checking the equipment. Then I heard that unmistakable voice belting out Magnificent and realized it wasn’t the sound techs, but the boys themselves. We rushed over to the stadium (see video below). The gates were all locked (we tried every single one), but we found one that gave us a peek at a sliver of the stage, and I stood there pressed up against the bars in disbelief and delirium as I caught my first glimpse of that black-haired, black-clad, sunglassed man. Seeing him made it real and unreal in the same blink. And what we heard being sound-checked! We watched as Bono, Edge and Adam entered and exited our line of sight, teasing us with bits of I Will Follow, Miss Sarajevo, City of Blinding Lights and two big ones for me: Zooropa (because it’s never been played at a U.S. show before, see video below) and All I Want Is You (because it’s my favorite U2 song and I haven’t heard it live since I saw PopMart when I was 18). We learned that immediately after sound check, U2 was playing a private show for about 300 invited guests and Special Olympics participants. After trying our best to finagle a way in, and failing, we continued to hang outside the stadium and listen to essentially an entire concert (see the setlist here). I heard AIWIY again in full, as well as Zooropa and some others I’d been excited about hearing, but it would be nothing compared to the next night, when I could actually see the band. Still, I was ecstatic to be in such close proximity to the band, despite my inadequate Floridian dress for weather in the 40s. I later learned Tim Tebow, former superstar quarterback for my Florida Gators, was in attendance. Bono and Tebow both at Invesco?! Quite a night. We hung out for a little bit waiting for the band to exit the stadium — we saw Dallas Schoo (Edge’s sound tech) and A.J. Rankin (crewmember and Bono’s cousin) and some others leave (see video below), but none of the fabulous four. A black towncar with even blacker tinted windows drove by and a few seconds later, someone came over and told us that was Bono leaving. In the same sigh, I was excited Bono had just driven by, crushed I didn’t get to meet him, and relieved I could go back to the hotel, get warm and sleep for a few hours. We were up again at 3:30 a.m. to be back in the GA line by 4 a.m. for roll call. This is the tough part, when you’re so tired you almost want to sacrifice placement and not go line up. You just want sleep. But that would be stupid. So, we braced ourselves for concrete, cold, passing trains, truck horns and awake members of the line having conversations two feet away from our makeshift beds. I’d finally drifted off to sleep for about 17 minutes when it was time to get back up and shift the line across the street onto stadium property. Getting a number Sharpied on your hand is the first wave of relief. Getting onto the venue property is the second. You feel like you’ve officially secured your spot. And now you can sleep slightly more soundly in the parking lot knowing you’re one step closer to that spot on the rail. I fell asleep at sunrise, huddled in my sleeping bag with three layers of clothes, gloves, a knit cap, and was freezing. I awoke with the sun beating down on me, my face well on the way to sunburnt, sweltering under the hotel’s microfleece blanket that I couldn’t flounce off me fast enough. The other GA-ers had been listening to me snore and assured me it was more cute than annoying. We spent several hours getting to know the people around us, especially awesome No. 78, Jon, and his friends, Chris and Michael, and No. 83, Susan, who Tim knew from several other shows, and Nos. 81 and 82, Dan and Jeff. The concert is obviously the best part of any U2 trip but the GA line is an incredible experience in its own right. You’re among your tribe, as Bono says. You start to talk with the people near you, immediately higher or lower on the list. You find out where they’re from (it’s rarely the city you’re actually in) and how far they’ve traveled for the show. You exchange stories on how you first got into the band, what shows you’ve seen, favorite albums, what U2 license plate you have and, if you’re lucky, “the time I met the band” stories. You ask about GA strategy … front rail, inside back rail, outside rail, Edge’s side, Adam’s side. I love this part. I’m with people who get *it* and get me. We share enthusiasm and adoration for the same thing. There’s an instant, unrivaled connection. Then there are other familiar faces in the U2 world. I got to meet Matt McGee, who runs atU2.com, and grab starvation-induced “best burgers ever” with him at Burger King in between the sound check and the dress rehearsal. I also met Deena Dietrich, who’s blogging her way across all 16 U.S. shows at ontheroadwithU2.com. In the GA line I spotted Nathaniel, who started up the “Bono: I Got Your Back” Facebook page after Bono’s surgery. He and his dad, Blake, have worked so hard to represent the thousands of well-wishing fans, sending care packages, designing T-shirts and more. I was thrilled to learn he got to meet Bono and Edge, as well as manager Paul McGuinness and audio director Joe O’Herlihy. Hanging out with Nathaniel, who started the "Bono: I Got Your Back!" campaign on Facebook after Bono's injury in May 2010. Show day in the GA line goes by in a blur. Before we know it, it’s 4 p.m. and they’re letting us into the stadium. This is the moment of truth. This GA line was handled incredibly well. They let us in 100 at a time, so we made the first wave in. And they had us line up in rows of five across and walk calmly to security, where our tickets are checked and our wrists banded. They herd us into the tunnel and we can see the Claw in all its black and orange and mint-green-gray glory in front of us. We all hold our hands high, so they can see wristbands, and then they drop the flag — allowing us in, but insisting we “walk, WALK, walk.” We walk, for about 10 steps, then sprint for the rail! (Watch video below to see what the GA sprint is like — you can see my red mop in the lower left corner a few times.) We’d decided to go outside rail for this show. I did front rail in 2009 and it was mindblowingly amazing, but I wanted to see what the show looked like from here, where you can see the screens and feel a little closer to the band when they walk out on the catwalk, which is much lower than the main stage. We aimed for the center and got incredible placement slightly left of it, between Bono’s mic and Edge’s mic. And we were right next to our GA friends, which added to the excitement. This is victory. Aside from braving the growing crowd to go to the bathroom one last time, we’re set. All we have to do is wait. The Fray — Denver hometown boys — played a great set; it was short, included the hits (Over My Head (Cable Car) and How to Save a Life), and front man Isaac Slade gave off incredible energy despite a still-filling stadium in the daylight. The highlight for me was the song Ungodly Hour, performed by their guitarist. I’d never heard it before, but was hypnotized. Then, before I know it, David Bowie’s Space Oddity is playing. This is the cue that U2 is seconds away from taking the stage. The Spaceship starts to smoke, we see them walking in on the screens, and then the lights go out and we realize that we hadn’t even realized it was dark. And then they emerge. Larry sits down first and starts pounding the hell out of his drums to start Even Better Than the Real Thing. Then The Edge, then Adam … and then Bono takes his place at the front of the stage. It’s electric. It’s a song I’ve been listening to since I was 12 years old — 20 years ago. It’s a song from my favorite U2 album, Achtung Baby. It’s a song that contains one of my all-time favorite lyrics, “Give me one last dance, we’ll slide down the surface of things,” which still makes me feel kind of funny when I hear it. And I’m seeing it live. (See video below, awesome footage shot by GA friend Dan.) U2’s return to the States has been worth the wait. I thought Breathe was a great opener in 2009, but was never excited when they switched to Beautiful Day for the European shows in 2010. Even Better is perfect. It sets the energy soaring from the start of the show. And I love that Bono comes up with a different way to introduce his bandmates and best friends at every show. In Denver, he introduced Adam as “a wonder of nature, a mythic creature,” and acknowledged that the bassist had become a father in the last year. He spotlighted Larry as “the fearsome beast of rhythm — part Terminator, part Duracell Bunny,” then joshed Edge as “the superhero who was bitten by a spider and turned into a nerd” — a nod to their love-it-or-hate-it involvement with Spider-Man: Turn Off the Dark. So, my first of eight shows is over. I can’t believe it’s come and gone. At one point during the trip, travel-weary and cold and sleep-deprived and feet aching, I debated if eight shows were really necessary. But when the boys took the stage, the U2 high set in. I warmed up. I woke up. I pinched myself to see if I was dreaming — and, indeed, I was. Your blog was such a joy to read!! It really took me through the entire experience again!! 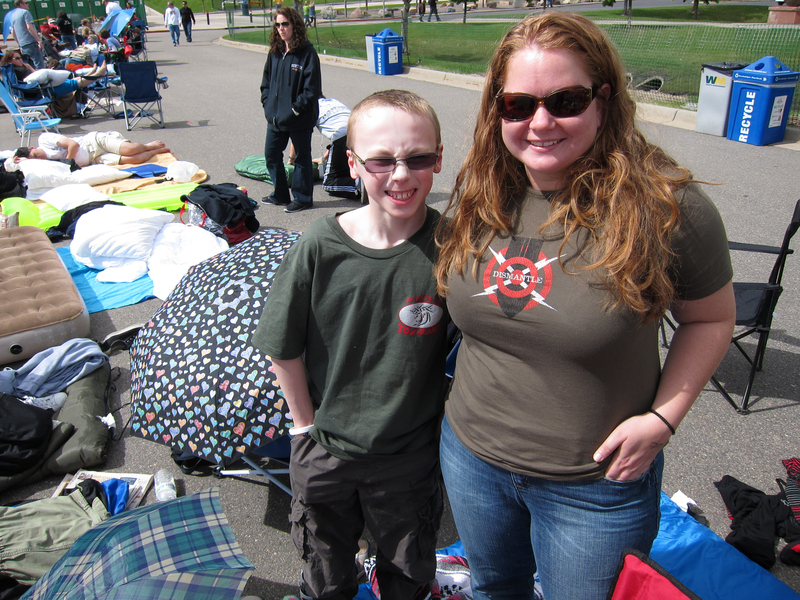 I really don’t know of anything more powerful, positive, and uplifting, than the U2 experience – GA line and all! A few days ago, I posted a little story on U2.com. I told the story of how I would sit in my bedroom with little sister…. around 1983. She discovered a U2 album in a record store in Peoria, Illinois. We would play it over and over again, and talk about how we loved the “new sound”. I clearly remember telling my classmates at school about this “new band”. They would tell us that “we were crazy”. I got a call from my best friend, while attending Western Illinois University in the 80’s. 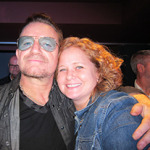 She attended the University of Illinois, and asked me if I wanted to come to U of I to see – U2- The Joshua Tree tour. Of course, I accepted. After that show, and the passion that came with it, I was hooked for life! Years later, I was asked to interview for a job at a nearby school district. The band director had noticed some U2 posters in my art office, and told me he had a really cool story to share with me sometime. A few months later, he told me of the story of U2 coming to U of I. My now former co-worker was a bartender and a student when U2 played U of I. He told me that he was in the middle of a busy night of working the bar, when the phone rang. It was a good friend of his on the other end. She said, “Hey!…. You need to come over to “such and such” sorority house right now!” She told him that, “U2 knocked on our door, came in, and Bono is playing the grand piano right now”. My former co-worker said that he went to the house.. people were lined up on the steps, on the floor, and everywhere else. And sure enough, Bono was sitting at the piano, playing and singing. This all took place in the 80’s, which was long before cell phones, twitter, and facebook. I don’t really think anything could happen like that, now. When I saw them at the University of Illinois, I knew in my heart and soul, that they would be HUGE! The passion that Bono had was unparalleled. I had been to every tour after Joshua Tree, but it wasn’t until they offered the GA in Elevation, that I was able to get close to them. I believe that’s when I met Tim C.
I actually look forward to seeing their shows now, more than ever. I don’t really know how to explain this passion to friends. It’s just one of those things, that only a few thousand people are able to experience. Thanks for sharing this beautiful story! I cannot wait until the next show!! Can it get here soon enough!?!? Your story is beautiful and perfect!! Thank you so much, Susan! I have chills after reading your story. The social network has made U2 friendships better than they’ve even been, but you’re right — those intimate, spontaneous moments in sorority houses are nearly impossible now. I’m envious you discovered them on The Joshua Tree and got to see that tour. But that’s the incredible thing about U2 — seeing them now is seeing everything they’ve ever been. Bono belting out I Will Follow the other night is the same vulnerable Bono who first sang it at 20. And they’re the same earnest foursome who first sang Streets in their late 20s. And the same cocky bastards who first sang Even Better in their early 30s. Being around U2, and the other people who love U2, makes up the best moments of my life. I cannot wait for the next show. Looking forward to seeing you again on the ride! This was an amazing recap Beth! Reading your post really helps relive an unbelievable epic journey. This was definitely my favorite show of the 360 tour. Thank you very much for sharing and creating a forum to share in. I truly hope our paths cross again and I envy your coming months. Jon, you were part of what made it such an incredible experience for me. I could not have come after a better number! I … will be with you again. Our paths will absolutely cross. The next few months have a lot to live up to after Denver. Looking forward to sharing the journey right here.